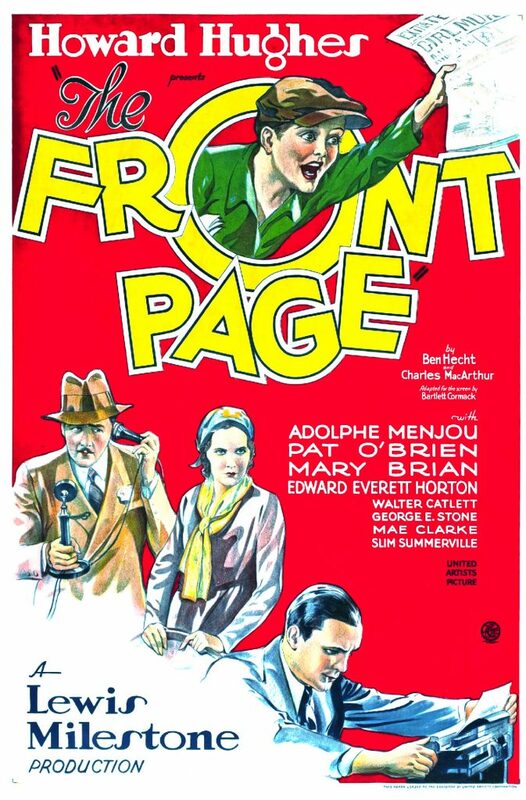 The Front Page is a 1931 American pre-Code comedy film, directed by Lewis Milestone and starring Adolphe Menjou and Pat O’Brien. Based on a Broadway play of the same name, the film was produced by Howard Hughes, written by Bartlett Cormack and Charles Lederer, and distributed by United Artists. The supporting cast includes Mary Brian, George E. Stone, Matt Moore, Edward Everett Horton and Walter Catlett. At the 4th Academy Awards, the film was nominated for Best Picture, Milestone for Best Director, and Menjou for Best Actor. In 2010, this film was selected for the United States National Film Registry by the Library of Congress as being “culturally, historically, or aesthetically significant”. The film is in the public domain. The film, considered a screwball comedy, centers on a reporter, Hildebrand ‘Hildy’ Johnson (Pat O’Brien) and his editor (Adolphe Menjou), who hope to cash in on a big story involving an escaped accused murderer, Earl Williams (Stone) and hide him in a rolltop desk while everybody else tries to find him.